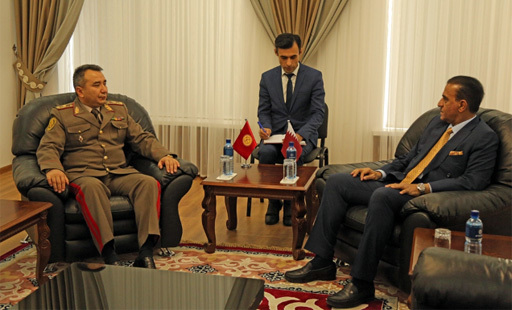 BISHKEK (Kyrgyz Army press service) — The Chief of Staff of the Armed Forces of the Kyrgyz Republic received Abdullah Ahmad Abdullah Saleh al Suleyti, Ambassador Extraordinary and Plenipotentiary of the State of Qatar, to discuss military cooperation between the two countries. Welcoming the guests, the Chief of the General Staff stressed that the Kyrgyz side wished to establish cooperation in a wide range of areas. The parties noted the intensification of bilateral contacts between the armed forces of the two countries. For example, in early October, representatives of the Kyrgyz Republic General Staff visited Qatar to discuss issues of military and technical cooperation and to contribute to the development of the capabilities of the Kyrgyzstan armed forces in crises. While limited in geographical size, Qatar benefits militarily from its important relationship with the West.